Wrong US Policies Claimed Lives of 600,000 Iraqi people? Question by TRUTH: Wrong US Policies Claimed Lives of 600,000 Iraqi people? Iran’s Foreign Minister Manouchehr Mottaki said in Geneva on Wednesday evening that the wrong policies of the US in Iraq claimed the lives of 600,000 people in that country. According to the Information and Press Bureau of the Ministry of Foreign Affairs, Mottaki made the remark in a UN-sponsored conference on disarmament in Geneva. In the meeting, Mottaki reviewed regional and international developments. Mottaki said: At the end of the Cold War some assumed that it was time for a unipolar world and imagined that relevant grounds should be prepared to help a dominant power expand its policies and ideas. He said: Based on this belief about six years ago they attacked Afghanistan and the same rule applied when targeting Iraq, adding that after six years there is no sign of security in Iraq or Afghanistan as pledged by the occupiers. He underlined: According to international statistics the wrong policies of the US claimed the lives of some 600,000 people in Iraq. Iran doesn’t have any room to criticize anyone about murders. Besides, Iran is an irrelevant state that will soon no longer exist. “We are delighted that peacebuilding, humanitarian and development NGOs are all united to bring people together on Peace Day 21 September 2012 in support of Peace One Day’s Global Truce 2012 campaign,” said Jeremy Gilley, founder of Peace One Day. Peace Day on 21 September has proven to be an annual opportunity for individuals and organisations across the world to carry out life-saving activities. In mid-June the Global Truce 2012 NGO Coalition was launched alongside Accord, BRAC, MAG (Mines Advisory Group), Mercy Corps, War Child and Viva Rio. “Together we can decrease the level of violence, raise awareness of our activities and save lives around the world. The impact of a day of global ceasefire and non-violence cannot be underestimated,” adds Jeremy. The growth of this coalition has been rapid. Starting with 120 NGOs in mid-June the Coalition has already doubled in numbers, with organisations from Colombia to Timor-Leste, Sweden to South Africa. This is the first year of the Global Truce Coalitions and the achievements on 21 September 2012 will not only set an important marker for future Peace Days, but will also reinforce the value of this annual day as a foundation for long-term sustainable peace. “If the full spectrum of NGOs that are out there combine efforts, our power will be greater than the sum of our parts. That’s the approach and the founding principle of the NGO Coalition. It is this ‘coalition’ oriented approach that will turn Jeremy’s efforts from a ‘Global Truce’ campaign into a true movement for peace,” emphasised Scott. All 240 NGOs have added their names to the coalition to support the need for peace. Many are now busy making plans as to how they will mark this special day. Across Interpeace, plans are being developed to mark Peace Day with Global Truce 2012 activities, sporting events, conferences, walks and much more. A Peace One Day flagship event will be headlined by Elton John and his band to celebrate the Global Truce 2012 on Peace Day, 21 September 2012. There will also be contributions from Peace One Day founder Jeremy Gilley and Peace One Day ambassador, Jude Law. Founded in 1999 by filmmaker Jeremy Gilley, the non-profit organisation Peace One Day (POD) drove the initiative that led to the unanimous adoption by the United Nations member states of an annual day of global ceasefire and non-violence on 21 September – Peace Day. With the day in place, POD’s objective is to institutionalise Peace Day around the world, making it self-sustaining. Not only has Peace Day been proved as a catalyst for broad-ranging civil society action by individuals and groups in every country of the world, but also for life-saving activities: in 2007, Jeremy Gilley, his film crew and Peace One Day ambassador Jude Law travelled to Afghanistan to help develop and document preparations for life-saving activities across the country for Peace Day. As a result of this work, since 2007, Peace Day agreements by all parties to conflict in the region have resulted in the immunisation against polio of 4.5 million children in areas hitherto unreachable or hard to reach due to conflict. 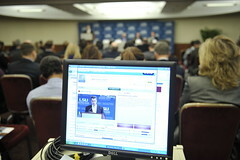 The United Nations Department for Safety and Security, which monitors security related incidents, recorded a 70% reduction in violent incidents on Peace Day 2008 in Afghanistan; it is this recorded reduction in violent incidents that has prompted Jeremy to launch the Global Truce 2012 campaign. For Peace Day 21 September 2012, Peace One Day is calling for and working towards a day of ceasefire and non-violence – the Global Truce 2012 campaign, what is hoped will be the largest ever reduction of violence on one day – a world record – and the largest ever gathering of individuals in the name of peace. Interpeace is an international peacebuilding organization headquartered in Switzerland with programmes in 16 conflict-affected countries. It was created by the United Nations in 1994 to work with societies divided by violent conflict to build sustainable peace. It became independent in 2000 and today has an innovative operational partnership with the United Nations. Interpeace currently supports 300 peacebuilders in programmes in Burundi, Cyprus, Guinea-Bissau, Israel, Liberia, Palestine, Rwanda, the Somali Region, Timor-Leste Central America (Guatemala, Honduras and El Salvador, Nicaragua, Costa Rica, Panama, Belize), and has a thematic programme on post-conflict constitution-making. After a successful career acting in film and television, Jeremy Gilley began making his own films in 1995 and in 1999 founded the non-profit film project Peace One Day to document his efforts to establish the first ever day of global ceasefire and non-violence. In September 2001, as a result of Jeremy’s efforts, a General Assembly resolution was unanimously adopted by United Nations member states, formally establishing 21 September as an annual day of global ceasefire and non-violence on the United Nations International Day of Peace – Peace Day. Under Jeremy’s leadership, Peace One Day’s overarching objectives are to institutionalise Peace Day throughout the world, making it a day that is self-sustaining, and to engage all sectors of society in the peaceful observance of 21 September in accordance with the United Nations resolution. In 2010, Scott was nominated by the Governing Council, chaired by former President of Ghana, John A. Kufuor, for a second 5-year term as Director-General. Scott began his career in the United Nations, first in disaster reduction and then in political affairs. Scott is a member of the Young Presidents’ Organisation (YPO), The Chatham House (UK), the Steering Committee of the Geneva Peacebuilding Platform. He is also a member of the Advisory Boards of the Geneva Centre for Security Policy (GCSP) and the Center for the Democratic Control of the Armed Forces (DCAF). He holds a Bachelor’s degree in International Relations, Economics and Russian from Georgetown University. Scott is French and American. Samantha Power discusses the political challenges facing democracy promotion and the practical needs of effective democratization. 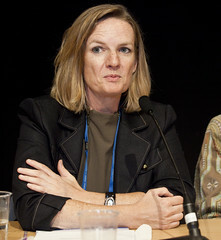 Dr. Samantha Power is The Anna Lindh Professor of Practice of Global Leadership and Public Policy at Harvard’s John F. Kennedy School of Government. Samantha Power discute des défis politiques à la promotion de la démocratie et les besoins pratiques d’une véritable démocratisation. Dre Samatha Power est titulaire de la chaire en Leadership mondial et politique publique Anna-Lindh à la Harvard John F. Kennedy School of Government. 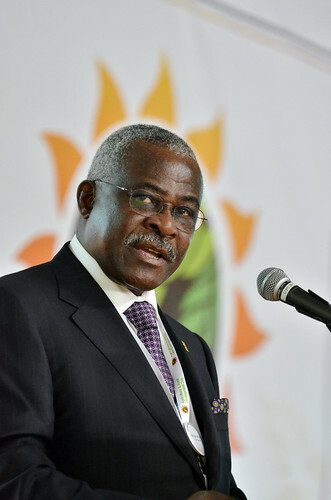 In the picture: Kanayo F. Nwanze, President. International Fund for Agricultural Development (IFAD). Photo: N. Palmer (CIAT). Please credit appropriately. In connection to the UNFCC COP 17 conference in Durban, South Africa in December 2011, CCAFS and several other partners organized an Agriculture and Rural Development Day (ARDD). It was a major one-day event that brought together several hundred policy makers, farmers, scientists and development experts to discuss the urgent need for rural people in developing countries to play a greater role and receive stronger support in climate change adaptation and mitigation. Nyungwe National Park has the largest population of endangered Eastern chimpanzees in the African nation of Rwanda. But big changes along the borders of the park—a mix of farmland, woodlots, and tea and pine plantations—may not be good news for the chimps. Beth Kaplin, core faculty member in the Department of Environmental Studies at Antioch University New England (AUNE), and doctoral candidate Robin Martino will head to Rwanda soon to study land uses in these areas and how changes may affect the chimpanzees in collaboration with Rwandan colleagues. A $ 46,000 grant from the U.S. Fish and Wildlife Service will fund the year-long study, which began in July. Martino said the project integrates three components: ecological, technological, and social –and the results have a potential to influence national policy concerning the buffer zone. Students from AUNE, and bachelor’s and master’s students from the National University of Rwanda will observe chimpanzees along forest edges, and map vegetation types using GIS technology, satellite imaging, and aerial photography, then verify those data on the ground. In 1971, AUNE offered the first environmental studies program in the country. Its Department of Environmental Studies has a history of delivering visionary, progressive and interdisciplinary programs aimed at helping students solve some of today’s most complex environmental challenges. The department offers a master of science degree in environmental studies with concentrations in conservation biology, advocacy for social justice and sustainability, science teacher certification, sustainable development and climate change, and self-designed studies. It also offers a master of science degree in resource and conservation management and a PhD in environmental studies. Antioch University New England offers highly respected doctoral, master’s, and certificate programs in education, environmental studies, management and psychology. Located in Keene, New Hampshire, this unique institution serves approximately one thousand students each year. Our graduates have gone on to be leaders of positive change, working toward a more just and sustainable society. Founded in 1964, Antioch University New England is the oldest of Antioch University’s graduate campuses. Learn more at: http://www.antiochne.edu. Inspired by the work of pioneering educator Horace Mann, Antioch University provides learner-centered education to empower students with the knowledge and skills to lead meaningful lives and to advance social, economic, and environmental justice. With campuses in Keene New Hampshire, Los Angeles, Santa Barbara, Seattle, and Yellow Springs, Ohio, Antioch University is a bold and enduring source of innovation in higher education. The University is accredited by the Higher Learning Commission of the North Central Association. if i have an associates in teaching can i change my major to environmental science/studies? Question by puppyface908: if i have an associates in teaching can i change my major to environmental science/studies? i currently attend community college and would like to change my major to environmental science when i go to university. Please help!!! Yes you can. At a junior college you only get the general ed classes that everyone is required. When you get an AA is just means you took more classes in a particular study but you only needed i believe 60 credits to trasnfer which when you do you can select your major. Job offer from OCEANIC CONSULTING for Shell Petroleum Development Co in Nigeria? Question by : Job offer from OCEANIC CONSULTING for Shell Petroleum Development Co in Nigeria? I am being asked to purchase OTIP insurance in advance in the sum of 3000.00usd. Is this a scam. I am Barrister John Obi, Immigration attorney mandated by Shell Petroleum Development Company of Nigeria to assist you on the Immigration procedures. There are three stages involved in the employment of expatriates in NIGERIA. Once the Comptroller General of the Nigerian Immigration Service (NIS) has approved the request for cable visa, it will be forwarded to the NIGERIAN EMBASSY who will issue you a S.T.R VISA. The regularization of stay is done here in NIGERIA on your arrival. You are to send me the following required documents so that I can make an application for you with the Nigerian Immigration Service (NIS) for the approval of your Resident/worker’s Permit, Cable Visa (which is a per-requisite for STR Visa) and Expatriate Quota. 4. A scanned copy of your international passport. THE EXPATRIATE TRAVELERS INSURANCE POLICY (ETIP) COVER is a mandatory requirement by the Nigerian Immigration Service (NIS) this is because the policy is proves that you are medically fit; to work in Nigeria and also it is a per-requisite to renew your resident/worker’s permit every year. The ETIP has benefits to the tune of $ 9,500 000.00 (NINE MILLION AND FIVE HUNDRED THOUSAND US DOLLARS) and the duration is one year, it should include benefits for loss of luggage, repatriations, medical, permanent disability and death etc. The preferred insurance company by the Nigerian Immigration Service (NIS) is NICON INSURANCE PLC, is a Nigerian Government owned insurance company located in Nigeria, so you are to look for their agent in your location. After you have applied for the ETIP policy, you will be issued a certificate. You are to send me a copy of the certificate Issued via electronically as attachment. Attached is the Nigerian Immigration Services form, you are to go through it carefully before filling it properly. On confirmation from the Nigerian Immigration Service (NIS) for of the approval of your cable visa, expatriate quota resident/worker’s permit, it will be forwarded to the Nigerian Embassy in your location. You will be invited from the Nigerian Embassy in your location for a brief interview for your S.T.R visa. The form attached is in PDF format, which means you need adobe acrobat to open it. These are the vital procedures which you must adhere to because it is in accordance to the” Expatriate Statutory Laws of the Federal Republic of Nigeria”. This letter is poorly written, obviously a scam.